Lightweight Canine Hock Brace | Labra Co.
Our Lightweight Hock Brace is a neoprene compression wrap which provides stability and support to the rear hock joint without compromising flexibility. As your dog ages, their joints will naturally deteriorate, just as they do in humans. Fight back against mobility limiting joint conditions such as arthritis with our Lightweight Hock Brace. SIZING: Please see photos for sizing guide and chart. If the brace you ordered does not fit, please email us right away, we will replace it. My dog loves the leg brace. It has given her more mobility and confidence. Very happy with the product! Nice. Easy to use. May need more support and would appreciate suggestions. Very happy with the braces. Great customer service! Cathy Spencer said: Great product! This has saved the day for me and for my 30 lb Scotty as she is recovering from her leg injury! 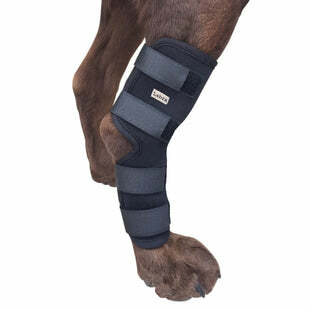 My large breed 10yr old dog sustained a hock injury and I was looking for a brace for added stability in his recovery. I ordered the large lightweight hock brace but it did not fit. I contacted Noah, the owner, and he sent me the xlarge at no additional cost. The brace fits perfectly and is providing that extra stability that my dog needs. Labra's customer service was excellent! Highly recommend this product! It helps but i should have ordered the maximum support. I am completely satisfied with the service. The seller is very helpful and very fast shipment. It fit with my 10 years old Maltese and his legs are a lot better without surgery. My dog and I really love it. The light-weight braces I ordered for my little Westie, who is 15 years old, are supporting him enough to get around the block on our walks. Which he couldn't do 2 weeks ago before he was using them. So happy! Bets having to pull him around in a red wagon. He loves his walks. Perfect to help keep my German Shepherd's hocks clean and dry. She had developed a very bad habit of licking her hocks and they were swollen and painful. Now I apply the medication, wrap her hocks in gauze and tape, then put on her leg braces, she leaves them alone now giving them the chance to heal. I'm back today to purchase another pair so she will always have a clean pair. I cannot say that they are helping but they do not seem to be hurting. I don't know that they are sturdy enough but we could not use the heavier duty as they were too long for his little legs. It seems that sometimes they help him stand a bit more erect however, his circumstances may not deem them the best solution. I am trying them in addition to a drug regimen to try to find the magic formula. I'm not sure it's helping... it's a small brace. Think I need one that goes all the way up his leg. I have a 12 yr old terrier mix that was going lame. Had to be on Rimadyl and was not able to support himself on his right hind leg. First time out, his back leg was working correctly again, he could support himself on the leg. Within a week he was totally off the Rimadyl. So I ordered another brace for a back up. Can not say enough good things about this product and the customer service was just as fabulous.